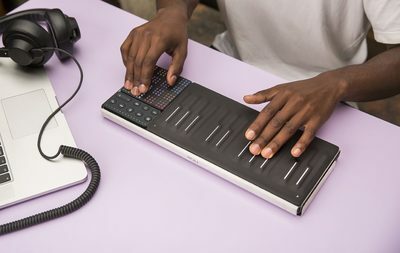 ROLI's Songmaker Kit, a portable music studio for creating a track anywhere, after a hugely successful limited release in UK and worldwide, is now available in India in association with ICHIBAN at www.ichibanonline.in; also with many Music Retailers. Songmaker Kit combines the Seaboard Block and Lightpad Block M, two cutting-edge controllers that have been hailed by professional reviewers as 'insanelyexpressive' and 'supremely powerful and arguably unique.' The tactile, touch-responsive surfaces of these blocks - both released within the past year - introduce a whole new way to shape sound and create songs. The Loop Block, which helps to record tracks and toggle between sounds, completes the kit. The Songmaker Kit comes with a software bundle. Each software tool integrates perfectly with the MIDI Polyphonic Expression (MPE) capabilities of ROLI BLOCKS controllers. Equator, ROLI's premium software synthesizer, is part of the package along with two digital audio workstations - Tracktion Waveform and Ableton Live Lite - and Strobe2 Player. Customized integration of hardware, software, and sounds make Songmaker Kit far more than the sum of its parts. The kit showcases ROLI BLOCKS, the modular music creation system that launched earlier. While it's possible to create dozens of kits with different Blocks, the Songmaker Kit's combination of Seaboard Block, Lightpad Block M, and Loop Block is a tried and tested configuration for next-level music-making. During its limited release, the kit met with huge demand and was sold out several times. Songmaker Kit combines Seaboard Block (Right), Lightpad Block M (Lower Left), and Loop Block (Upper Left) in one integrated yet flexible instrument. Songmaker Kit comes with a snapcase that protects the kit when someone's on the move. It also Songmaker Kit comes with a package of software for desktop and mobile. It includes ROLI's software synthesizer Equator plus two digital audio workstations: Ableton Live Lite and Tracktion Waveform. Songmaker Kit is now available to purchase at retailers in India. Blocks is the instrument that grows along with the musician. It is ideal to start with one block, thereby connecting more together, and expanding the instrument along with their skills. The centerpieces of the system are the Lightpad Block and the Seaboard Block, two powerful music-making devices that feature soft, touch-responsive surfaces. Anyone can get started with the Lightpad Block and the ROLI PLAY app. Skilled musicians can start with several Blocks together and enjoy a huge suite of free music software. Flexible and approachable, BLOCKS has something for everyone. ROLI is creating the future of musical instruments, through revolutionary touch-responsive interfaces. The concept is to make every movement musical on the Seaboard GRAND, Seaboard RISE, Seaboard Block, Lightpad Block, NOISE app, ROLI PLAY app, and other hardware and software tools. Renowned artists love the Seaboard and BLOCKS, which are also opening up music to learners and extending the joy of music creation to everyone. The focus of Brand ICHIBAN is to launch unique and cutting edge Technology Products in India at affordable price. ICHIBAN products now available are Digital Thermometers, GSM Walky Others Branded, High Tech, Products now sold in India are Autonics, Testo, TMC, LCR, Plasel, Luxfer and many others. Manufacturing and marketing high tech, unique products under brand ICHIBAN, now introduces ROLI BLOCKS in India.